Iron Dome (Hebrew: כִּפַּת בַּרְזֶל, kippat barzel) is a mobile all-weather air defense system developed by Rafael Advanced Defense Systems and Israel Aerospace Industries. The system is designed to intercept and destroy short-range rockets and artillery shells fired from distances of 4 kilometres (2.5 mi) to 70 kilometres (43 mi) away and whose trajectory would take them to an Israeli populated area. Israel hopes to increase the range of Iron Dome's interceptions, from the current maximum of 70 kilometres (43 mi) to 250 kilometres (160 mi) and make it more versatile so that it could intercept rockets coming from two directions simultaneously. Three/four launchers, each carrying 20 interceptors. Iron Dome was declared operational and initially deployed on 27 March 2011 near Beersheba. On 7 April 2011, the system successfully intercepted a BM-21 Grad launched from Gaza for the first time. On 10 March 2012, The Jerusalem Post reported that the system shot down 90% of rockets launched from Gaza that would have landed in populated areas. By November 2012, official statements indicated that it had intercepted over 400 rockets. By late October 2014, the Iron Dome systems had intercepted over 1,200 rockets. In addition to their land-based deployment, Iron Dome batteries will in the future be deployed at sea, where they will protect off-shore gas platforms in conjunction with Israel's Barak 8 missile system. Iron Dome is part of a future multi-tiered missile defense system that Israel is developing, which includes Arrow 2, Arrow 3, Iron Beam, Barak 8 and David's Sling. Hezbollah, based in Lebanon, fired rockets into northern Israeli population centers in the 1990s, posing a security challenge for the Israel Defense Forces. Israel had floated the idea of its own short-range antimissile system, but U.S. defense officials cautioned that it would be "doomed to fail". 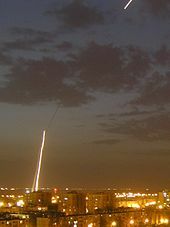 During the 2006 Second Lebanon War, approximately 4,000 Hezbollah-fired rockets (the great majority of which were short-range Katyusha rockets) landed in northern Israel, including on Haifa, the country's third largest city. The rocket barrage killed 44 Israeli civilians and caused some 250,000 Israeli citizens to evacuate and relocate to other parts of Israel while an estimated 1 million Israelis were confined in or near bomb shelters during the conflict. To the south, more than 8,000 projectiles (estimated at 4,000 rockets and 4,000 mortar bombs) were fired indiscriminately into Israeli population centers from Gaza between 2000 and 2008, principally by Hamas. Almost all of the rockets fired were Qassams launched by 122 mm Grad launchers smuggled into the Gaza Strip, giving longer range than other launch methods. Nearly a million Israelis living in the south were within rocket range, posing a serious security threat to the country and its citizens. In February 2007, Defense Minister Amir Peretz selected Iron Dome as Israel's defense against this short-range rocket threat. Since then, the 210 million (US) system has been developed by Rafael Advanced Defense Systems working jointly with the IDF. Project leader Colonel S. and his team in the Administration for the Development of Weapons and Technological Infrastructure (Maf'at) had very little spare time, and only on the weekends could they think of an appropriate name for the system. According to Colonel S., "The first name I thought of was 'Anti-Qassam', but when the project started to move forward I realized it was problematic... I sat down with my wife, and together we thought of suitable names. She suggested the name 'Tamir' (Hebrew acronym for טיל מיירט, Til Meyaret, 'interceptor missile') for the missile, and for the system itself we thought of 'Golden Dome'. The following Sunday, 'Tamir' was immediately approved, but there was a problem with 'Golden Dome'—it could be perceived as ostentatious. So it was changed to 'Iron Dome'." The system is designed to counter short-range rockets and 155 mm artillery shells with a range of up to 70 kilometers. According to its manufacturer, Iron Dome will operate day and night, under adverse weather conditions, and can respond to multiple threats simultaneously. 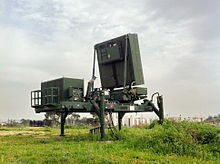 Detection & Tracking Radar: the radar system is built by Elta, an Israeli defense company and subsidiary of Israel Aerospace Industries, and by the IDF. Battle Management & Weapon Control (BMC): the control center is built for Rafael by mPrest Systems, an Israeli software company. An example of an interceptor missile used by Iron Dome. Missile Firing Unit: the unit launches the Tamir interceptor missile, equipped with electro-optic sensors and several steering fins for high maneuverability. The missile is built by Rafael. The system's radar is referred to as EL/M-2084. It detects the rocket's launch and tracks its trajectory. The BMC calculates the impact point according to the reported data, and uses this information to determine whether the target constitutes a threat to a designated area. Only when that threat is determined, is an interceptor missile fired to destroy the incoming rocket before it reaches the predicted impact area. The typical air defense missile battery consists of a radar unit, missile control unit, and several launchers, all located at the same site. Conversely, Iron Dome is built to deploy in a scattered pattern. Each launcher, containing 20 interceptors, is independently deployed and operated remotely via a secure wireless connection. Reportedly, each Iron Dome battery is capable of protecting an urban area of approximately 150 square kilometers. The initial funding and development of the Iron Dome system was provided and undertaken by Israel. This allowed for the deployment of the first two Iron Dome systems. Subsequently, funding for an additional eight Iron Dome systems—along with funding for a supply of interception missiles—is currently being provided by the United States, with two of these additional systems having been delivered by 2012. Funding for the production and deployment of these additional Iron Dome batteries and interceptor missiles was approved by the United States Congress, after being requested by President Obama in 2010. In May 2010, the White House announced that U.S. President Barack Obama would seek $205 million from U.S. Congress in his 2011 budget, to spur the production and deployment of additional Iron Dome batteries. White House spokesman Tommy Vietor stated, "The president recognizes the threat missiles and rockets fired by Hamas and Hezbollah pose to Israelis, and has therefore decided to seek funding from Congress to support the production of Israel's short range rocket defense system called Iron Dome." This would be the first direct U.S. investment in the project. Such financial assistance could expedite the completion of the defensive system, which has long been delayed by budgetary shortfalls. A few days later, on 20 May 2010, the U.S. House of Representatives approved the funding in a 410–4 vote. The bill, the United States–Israel Missile Defense Cooperation and Support Act (H.R. 5327), was sponsored by Representative Glenn C. Nye of Virginia. This money was expected to be included in the 2011 budget. Once the money was received in 2011, it still took a further 18 months before the additional batteries were delivered to the air force. On 9 May 2011, Haaretz published that Defense Ministry director general Maj. Gen. (res.) Udi Shani said that Israel plans to invest nearly $1 billion in the coming years for the development and production of Iron Dome batteries. "We are no longer approaching this in terms of initial operational capabilities but are defining the final target for absorbing the systems, in terms of schedule and funds. We are talking about [having] 10–15 Iron Dome batteries. We will invest nearly $1 billion on this. This is the goal, in addition to the $205 million that the U.S. government has authorized," Shani said. On 4 April 2012, Reuters reported that a senior Israeli official, during a briefing to a small group of journalists on condition of anonymity, predicted an increased interception range of up to 250 km, as well as more flexible aiming of Iron Dome units, thus lowering the number of batteries needed for full deployment in Israel. That would help Israel to cope with the prospect of reduced funding from the United States, while a "new round" of talks about missile-defense funding would be completed in two to three months, he anticipated. While praising American largess, the official said US planners have asked Israel to "point out honestly where the upper limit is in terms of what can be implemented" with the Iron Dome. He said the US is "deep in (fiscal) challenges itself", so it does not want to "give money for the sake of it". In exchange for the second tranche of deployment funding, the United States is asking Israel for access to, and a stake in, elements of the system's technology. On 17 May 2012, when Israeli Defense Minister Ehud Barak met with U.S. Secretary of Defense Leon Panetta, the Pentagon issued a statement from the Secretary saying in part, "I was pleased to inform Minister Barak that the President supports Israel's Iron Dome system and directed me to fill the $70 million in assistance for Iron Dome that Minister Barak indicated to me Israel needs this fiscal year." On 18 May 2012, the United States House of Representatives passed the Fiscal Year 2013 National Defense Authorization Act, H.R. 4310, with $680 million for Iron Dome in Section 227. The report accompanying the bill, 112–479, also calls for technology sharing as well as co-production of Iron Dome in the United States in light of the nearly $900 million invested in the system since 2011. SECTION 227, IRON DOME SHORT-RANGE ROCKET DEFENSE PROGRAM, would authorize $680.0 million for the Iron Dome system in fiscal years 2012–15 in PE 63913C for procurement of additional batteries and interceptors, and for operations and sustainment expenses. This section would also require the Director, Missile Defense Agency to establish within MDA a program office for cooperative missile defense efforts on the Iron Dome system to ensure long-term cooperation on this program. The committee is aware that National Defense Authorization Act for Fiscal Year 2011 (Public Law 111-383) included $205.0 million for the Iron Dome short-range rocket defense system for the State of Israel. The committee notes that the Iron Dome system has proven very effective at defeating threat rockets launched at protected targets. The committee also notes that if the full $680.0 million is used on the program, the total U.S. taxpayer investment in this system will amount to nearly $900.0 million since fiscal year 2011, yet the United States has no rights to the technology involved. The committee believes the Director should ensure, prior to disbursing the authorized $680 million for Iron Dome, that the United States has appropriate rights to this technology for United States defense purposes, subject to an agreement with the Israeli Missile Defense Organization, and in a manner consistent with prior U.S.–Israeli missile defense cooperation on the Arrow and David's Sling suite of systems. The committee also believes that the Director should explore any opportunity to enter into co-production of the Iron Dome system with Israel, in light of the significant U.S. investment in this system. On 4 June 2012, the U.S. Senate Armed Services Committee included $210 million for Iron Dome, in its version of the National Defense Authorization Act for 2013, S.3254. The bill has been reported out of committee and is waiting to be assigned a date for consideration by the full Senate. SEC. 237, AVAILABILITY OF FUNDS FOR IRON DOME SHORT-RANGE ROCKET DEFENSE PROGRAM, said that of the amounts authorized to be appropriated for fiscal year 2013 by section 201 for research, development, test, and evaluation, defense-wide, and available for the Missile Defense Agency, $210,000,000 may be provided to the Government of Israel for the Iron Dome short-range rocket defense program as specified in the funding table in section 4201. On 17 January 2014, President Barack Obama signed the fiscal year 2014 Consolidated Appropriations Act. The bill provides $235 million for Israel to procure the Iron Dome system. The Israeli government has also agreed to spend more than half the funds the United States provides for the Iron Dome system in the United States. Funds going to U.S. contractors will increase to 30 percent in 2014 and 55 percent in 2015 from 3 percent previously, according to a U.S. Missile Defense Agency report to Congress. On 1 August 2014, Congress approved a measure to deliver an additional $225 million in aid to Israel, with the aim of replenishing funds for the Iron Dome system in the midst of the conflict between Israel and Hamas. Following the signing of bill, for which "the Senate and House of Representatives as well as Republicans and Democrats set[ting] aside differences to advance Israel’s emergency request," the White House stated that "The United States has been clear since the start of this conflict that no country can abide rocket attacks against its civilians" and that it "supports Israel’s right to defend itself against such attacks." Senate Report 113-211 from the U.S. Government Publishing Office, which accompanied text H.R. 4870, recommended an increase in funding for the program for FY-2015. The report calculates "U.S. investment in Iron Dome production since fiscal year 2011" to be over $1 billion. With the United States on track to greatly increase funding for Iron Dome, there have been calls for technology transfer and co-production of Iron Dome in the United States. Just as the US and Israel share co-production of the Arrow III missile system, with Boeing manufacturing 40–50 percent of the production content, there has been support in the U.S. Congress, media and think tanks in favor of co-production. The U.S. House of Representatives included report language in its FY-2013 Defense Authorization Act supporting Iron Dome with $680 million but also instructing that the Director of the U.S. Missile Defense Agency, Lt. Gen. Patrick O'Reilly, "should explore any opportunity to enter into co-production of the Iron Dome system with Israel, in light of the significant U.S. investment in this system." There are media reports that the Pentagon is requesting similar language in the Senate Defense Authorization Act as well as the respective House and Senate defense appropriations bills for 2013. Adding Iron Dome to the list of high-tech military programs built jointly by both nations would help further strengthen ties between Israel and the United States. In July 2014 it was announced that Raytheon will be the major U.S. partner in co-production of major components for the Iron Dome's Tamir intercepting missile. The U.S. firm will supply components through various subcontractors. In 2005, Brig. Gen. Danny Gold, then head of Maf'at, decided to start the program that would include the system's research and a demonstration of the intercepting system. In 2007, Israel commissioned the development of Iron Dome, choosing Israeli contractor Rafael over the American giant Lockheed Martin. Israeli company mPrest Systems was put in charge of programming the core of Iron Dome's battle management system. Iron Dome went from the drawing board to combat readiness within less than four years, a remarkably short period of time for a weapons system designed from scratch, according to military experts. There was no system like this, anywhere in the world, in terms of capabilities, speed, accuracy. We felt like a start-up. According to the leading developers of Iron Dome, due to schedule and low-cost settings constraints, some of the missile components have been taken from a toy car sold by Toys "R" Us. July 2008: the Tamir interceptor missile underwent successful testing. March 2009: Israel successfully tested the missile defense system, though without yet actually intercepting an actual projectile. July 2009: the system successfully intercepted a number of rockets mimicking Qassam and short-range Katyusha rockets in a Defense Ministry test. August 2009: the IDF completed the establishment of a new battalion that will operate the Iron Dome system. The battalion is a part of the Israel Air Force's Air Defense Division. The system was to be first deployed along the Gaza border and then along the border with Lebanon. The system was slated to start operating in mid-2010. January 2010: Iron Dome successfully intercepted multiple rocket barrages mimicking Qassams and Katyushas. Defense Ministry Director-General Pinhas Buchris stated that the system would ultimately "transform" security for the residents of southern and northern Israel. July 2010: The system successfully intercepted multiple rocket barrages mimicking Qassams and Katyushas. During the test, Iron Dome successfully distinguished rockets which were threats from those that would not land in designated areas and did not need to be intercepted. March 2011: Iron Dome was declared operational by the IDF, and Defense Minister Ehud Barak authorized deployment. During the first stage of Iron Dome's operational duty, the Israeli Air Force included many soldiers from Sderot, citing high motivation among the city's pre-army youth to be part of the project. The 947th "Marksmen" Stinger Battalion of the Israeli Air Defense Network was chosen as the first unit to become familiar with and operate Iron Dome. Although Iron Dome has proven its effectiveness against rocket attacks, Defense Ministry officials are concerned it will not be able to handle more massive arsenals possessed by Hezbollah in Lebanon should a conflict arise. Although in Operation Protective Edge it had a 90 percent hit rate against only rockets determined to be headed for populated areas, 735 intercepts were made at a cost of $70,000–100,000 per interceptor; with an estimated 100,000 rockets possessed by Hezbollah, Iron Dome systems could be fiscally and physically overwhelmed by dozens of incoming salvos. Directed-energy weapons are being investigated as a complement to Iron Dome, and are prized for less costly defense capabilities provided both in terms of system cost and cost per shot. Solid-state lasers worldwide have power levels ranging from 10–40 kW; to destroy a rocket safely from 15–20 km (9.3–12.4 mi) away, several low-power beams could coordinate and converge on one spot to burn through its outer shell and destroy it. Because laser beams become distorted under fog or heavy cloud conditions, any laser would be used in conjunction with Iron Dome rather than as a replacement for it. In 1996, the Israelis developed the Nautilus prototype and later deployed it in Kiryat Shmona, Israel's northernmost city along the Lebanese border. It used a collection of components from other systems and succeeded in keeping a beam on the same point for two continuous seconds using an early prototype of the Green Pine radar. Nautilus succeeded in its goal to prove the concept was feasible, but it was never deployed operationally, as the government believed the cheaper alternative was sending in ground troops to stop rocket fire at their source. At the 2014 Singapore Air Show, Rafael unveiled its Iron Beam laser air-defense system. Iron Beam is a directed-energy weapon made to complement the Iron Dome system by using a high-energy laser to destroy rockets, mortars, and other airborne threats. Development of the system began sometime after the joint United States and Israel Nautilus laser development program ended. In December 2014, former Israeli Air Force chief and head of Boeing Israel David Ivry showed interest in the American Laser Weapon System. Earlier that month, the U.S. Navy revealed that the LaWS had been mounted on the USS Ponce and locked on to and destroyed designated targets with near-instantaneous lethality, with each laser shot costing less than $1. In October 2014, Rafael unveiled a naval version of the Iron Dome called C-Dome. It is designed to protect vessels in blue and littoral waters from ballistic trajectory and direct attack weapons fired in saturation attacks. C-Dome includes a 10-round canister loaded with vertically-launched Tamir interceptors for 360-degree coverage, a feature not supported by the land-based Iron Dome system; the ship's own surveillance radar is used to negate the need for a dedicated fire control radar. The system has a small footprint to enable installation on small ships like offshore patrol vessels, corvettes, and even stationary oil rigs. Though in the very early stages of concept development, Rafael estimated that it could take less than a year to build a prototype C-Dome system. Preliminary discussions with potential users have already been launched. The C-Dome will be used on the Israeli Navy's Sa'ar 6-class corvettes. On 18 May 2016 Col. Ariel Shir, head of Israeli Naval operation systems announced that the system had successfully intercepted and destroyed a salvo of short range missiles while deployed on a naval vessel at sea. On 27 November 2017, the Israeli military declared initial operational capability for the C-Dome, completing more than 18 months of integration and design work. The Iron Dome has been pitched to the IDF as a more cost-effective anti-aircraft system to intercept unmanned aerial vehicles. Some estimates of the cost of a Tamir interceptor are around $100,000, but it is still 95 percent cheaper than using a MIM-104 Patriot, the primary Israeli interceptor, costing $2–3 million. Although the Patriot has broader coverage, the low cost of UAVs and operational scenarios they would be encountered in would make Iron Dome equally effective against them. No material upgrades would be needed to optimize the system for drone-killing missions, as this role and capability has been publicized from its inception. In July 2015, Rafael released video footage of Iron Dome interceptors destroying several low and high-flying UAVs in a test. Although some targets were destroyed by proximity-operated warheads, in others the interceptor achieved a kinetic hit. The company says the system is capable of destroying armed UAVs before they can get close enough to release their munitions, and most medium-altitude reconnaissance UAVs before they are close enough to survey an area. In June 2016, it was revealed that the Iron Dome had been tested to successfully intercept salvos of artillery shells, which are typically difficult to destroy because of the need to penetrate the thickness of their metal casings to get to the warhead, and "multiple" air-to-ground precision guided munitions (PGMs) similar to the Joint Direct Attack Munition (JDAM). The Iron Dome system began operating in early 2011, initially deployed at air force bases in southern Israel. It was designated to be set up in other areas, such as the town of Sderot, during significant escalations along the Gaza border. On 27 March 2011, Al Jazeera English reported that Iron Dome has been deployed for the first time. Brigadier-General Doron Gavish, commander of Israel's air defense corps, said Iron Dome had passed a series of tests and reached its "evaluation phase" in the field. It was stationed near Beersheba, following two rocket attacks on the area that month. On 7 April 2011, after deployment as an "operational experiment" on 3 April, the Iron Dome system in the area of Ashkelon successfully intercepted a Grad rocket fired at the city, the first time a short-range rocket fired from Gaza had been intercepted. According to reports from the area, the interception could be seen in Israeli towns near northern Gaza. Immediately afterwards an IAF aircraft successfully attacked the squad that had fired the rocket. Later that day the IDF stressed that the system, though operational, was still under evaluation. On 8 April the system successfully intercepted another four rockets. On 12 April, the IDF announced it would accelerate the introduction of a third Iron Dome battery. According to Haaretz, IDF officials indicated that the security establishment intended to ensure that the third battery would become available in six months, instead of the expected 18 months. According to the new plan, launchers from existing systems would be combined with other components that had already been manufactured in order to speed up the battery's production. In that way, the first operational Iron Dome battalion would come into being within six months, with batteries that could be deployed in the south or in other arenas. Also according to Haaretz, the IDF was to finalize its long-term Iron Dome acquisition program—nicknamed "Halamish"—within a few months (from April 2011), which would indicate the final number of systems to be introduced into the military. Israel Air Force officials estimated the number of Iron Dome systems needed to cover threatened areas as thirteen. According to Meir Elran, a scholar at the Institute of National Security Studies in Tel Aviv, Israel would need a total of 20 batteries to provide adequate defense for its borders with Gaza and Lebanon. Such a deployment would require financial assistance from the United States, but he said that even in the original limited form, officially designated a trial period, the system was important. On 5 August 2011, the IDF redeployed the Iron Dome system near Ashkelon following days of heightened rocket fire from Gaza into Israel. The deployment came a day after Ashkelon mayor Benny Vaknin sent Prime Minister Benjamin Netanyahu and Defense Minister Ehud Barak a letter asking them to redeploy the system. On 18 August 2011, four rockets were fired from Gaza at Ashkelon. The system determined that two were a threat and intercepted them, ignoring the other two which were directed at non-populated areas. No injuries or damage were reported. Defense officials said that Iron Dome would be re-deployed in Beersheba. On 20 August 2011, while engaging with a volley of seven rockets fired almost simultaneously at Be'er Sheva from Gaza, one was not intercepted by the defense system, exploding in a residential area and killing Yossi Shushan. Brig. Gen. Doron Gavish, commander of the IAF's Air Defense Corps, said on the following day that "we said in advance that this wasn't a hermetic system," adding that the air defense units were learning on the fly and improving the performance of Iron Dome while operating it. "This is the first system of its kind anywhere in the world; it is in its first operational test; and we've already intercepted a large number of rockets targeting Israeli communities, saving many civilian lives," Gavish said. On 21 August 2011, Ynetnews reported that the success of the Iron Dome system against Gazan rocket fire had southern city mayors battling over the right to be the next to have it deployed in their area. The IDF stressed that "no system can offer airtight protection" and that the system positioned in Ashkelon was incapable of extending its defense to Ashdod, but this did not stop the mayors from pressuring the Defense Ministry and the IDF to position Iron Dome batteries within their city limits. Ashdod, Ofakim, Netivot, Beersheba, and Ashkelon have all pursued the system, but the IDF had only two batteries available. On the same day, The Jerusalem Post reported that Defense Minister Ehud Barak announced that a third Iron Dome battery would be installed in the region "within weeks", and estimated that nine more batteries would be positioned within the next two years[needs update]. In attacks shortly before, the Iron Dome system had successfully intercepted about 85% of the rockets identified as threats to populated areas by the Battle Management Control (BMC) system launched at Israel from Gaza. On 23 August 2011, Globes reported that Rafael would invest tens of millions of shekels in the following months to open a second production line for the Iron Dome's Tamir interceptor missiles. Future operational needs, as well as the plan to build two more Iron Dome batteries by the end of the year, necessitated the increase of missile production. On 31 August 2011, the IAF deployed a third Iron Dome battery outside Ashdod. Defense Minister Ehud Barak, who had said earlier in the week that it would take 10 days until the battery was deployed near Ashdod, praised the IDF and the IAF Air Defense Division for beating the deadline and beginning the deployment before the opening of the school year. On 1 December 2011, Brig. Gen. Gavish said that a fourth battery of the system would be deployed in the "coming months". He spoke to The Jerusalem Post ahead of the Air Defense Division's largest-ever draft of soldiers needed to fill the ranks of its increasing number of units and battalions. "The numbers will continue to grow and another battery will become operational in the beginning of the year," he said. On 8 December, "outstanding" officer Capt. Roytal Ozen began to command the battery's unit in preparation for its deployment, the first woman to be in charge of the system. On 6 December 2011, Matan Vilnai, the Israeli Minister of Home Front Defense, said that the Defense Ministry is considering a permanent deployment of an Iron Dome battery in the Haifa Port to protect the oil refineries there against future Hezbollah rocket attacks. "The continued work of the oil refineries is critical for the Israeli economy during a time of war," he said. During the Second Lebanon War in 2006, a number of Katyusha rockets struck Haifa but did not hit the refineries. A direct hit on one of the refineries may cause numerous casualties as a result of leakage of dangerous chemical substances. The port is also the site of a chemical terminal that includes containers of ammonia and ethylene gas. On 22 August 2011, Haaretz reported that according to Israeli security sources, Palestinian militants changed their rocket-launching tactics in an attempt to evade the two Iron Dome batteries deployed in southern Israel. The new tactics included aiming more frequently at areas beyond the Iron Dome protection range. After the Palestinian launch teams realized that the systems deployed in the previous two weeks around Ashkelon and Be'er Sheva provided near-perfect protection from rockets, they began firing more frequently at Ashdod and Ofakim. When they did aim at Beersheba on 21 August, they did not fire one or two rockets, as in the past, but rather a volley of seven rockets almost simultaneously. Iron Dome intercepted five of them successfully, but one penetrated the defense system, exploding in a residential area and killing a man. On 8 August 2011, the Israeli High Court of Justice rejected a petition asking that the government be ordered to deploy the system in Gaza border communities. In rejecting the petition, Supreme Court President Dorit Beinisch and Justices Salim Joubran and Uzi Fogelman ruled that in balancing all relevant considerations including budgets, changing security realities and operational matters, the government's decision not to deploy the Iron Dome in the area was reasonable. The panel of justices also said that the court had no reason to intervene in operational decisions regarding where to deploy the Iron Dome system. "We believe the [government] will make the necessary decisions in accordance with the time and place requirements," they said. In its petition, the Eshkol Regional Council argued that the government should be ordered to deploy the Iron Dome to protect communities between 4.5 and 7 kilometers from Gaza from rocket fire. Government-funded rocket-roof protection is in place for homes in communities within 4.5 km of Gaza, but not for structures further from the border. The state said that the High Court should not intervene in the "military decision" regarding how and where to deploy the anti-rocket system. It also argued that if the court were to order it to deploy Iron Dome in a specific area, budgetary limitations would result in other communities not receiving protection, particularly as the range of Palestinian rockets had grown in recent years and therefore it was not possible to deploy Iron Dome to protect every community. On 26 December 2011, an accident occurred during a maintenance drill involving one of the systems. While loading missiles into a launcher vehicle from a bunker at the Air Defense Network's school near kibbutz Mashabei Sadeh in the Negev, two soldiers caused twenty Tamir interceptors to fall from a height of four meters near soldiers and officers without detonating, causing no injury, but making them unserviceable. Ynetnews reported that the soldiers were never in danger because the interceptor missiles are equipped with a security mechanism that prevents premature explosions. The IDF Spokesperson's Unit said that the Air Force commander, Maj. Gen. Ido Nehushtan, appointed a committee to examine the accident and ordered an immediate stop to all Air Defense Network maintenance work until a preliminary investigation was concluded. It also said that during the following week actions would be taken to "improve skills and safety awareness". A security official told Reshet Bet that the failure was twofold in that the soldiers and their commander deviated from severely strict safety protocols, and 20 costly interceptors were lost. Walla! website reported that the soldiers made a mistake in loading the missiles and they fell backwards. The website calculated the damage at $1 million USD (at $50,000 per missile). The missiles were transferred back to Rafael to determine whether they could be repaired. On 1 January 2012, those soldiers were sentenced to punishment by the school's commanding officer following an inquiry into their conduct regarding the incident. The lieutenant in charge of the loading crew was given 21 days in mahbosh, while the sergeant in charge of the technician crew was given 14 days. After the IDF killing of Zohair al-Qaisi, the secretary general of the Popular Resistance Committees in Gaza on 9 March 2012, more than 300 rockets were fired on Israel. Some 177 fell on Israeli territory. 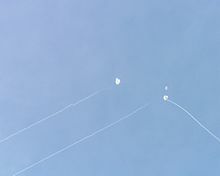 The Iron Dome system had successfully intercepted at least 56 rockets (directed at population centers) in 71 attempts. On 11 July 2012, Ynetnews reported that on that day the Iron Dome system was deployed in the greater Eilat area as a part of an IDF survey meant to test it in various areas across Israel. The IDF published on its website that the Iron Dome battery will be temporarily stationed there as part of an effort to test and prepare different sites across the country for the possibility of permanently stationing there additional batteries. "Since the system continues to grow and improve, it is important to test potential sites," said a commander from the Air Defense Formation. "After stationing Iron Dome batteries in numerous regions in southern Israel, including Ashkelon, Ashdod, Netivot and Gush Dan—it is time to test the southernmost region in the country, Eilat." Haaretz reported that an official, speaking on condition of anonymity, said the interceptors were set up on 9 July. Three weeks beforehand, two Katyhusha rockets were fired into southern Israel, and according to The Jerusalem Post the IDF believes that they originated from the Sinai. According to the report, IDF assessments are that they were either fired by a Palestinian rocket cell from Gaza—affiliated either with Hamas or Islamic Jihad—or by Bedouin freelancers who work for them. The launches followed an earlier one in April 2012, when at least one Katyusha rocket was fired from the Sinai to Eilat. Ynetnews reported that according to a military source, following these rocket attacks, the IDF decided not to take any chances and calibrated the system to the region's topography, before finally deploying it. The system's deployment was coordinated with local communities and the City of Eilat, in order to prevent public panic. According to the Israeli Air Force, during operation "Pillar of Defense" (14–21 November 2012) Iron Dome made 421 interceptions. On 17 November, after two rockets targeted Tel Aviv during the operation, a battery was deployed in the area. Within hours, a third rocket was intercepted by the system. This fifth battery had not been scheduled to come into service until early 2013. CNN relayed an estimate that Iron Dome's success rate in Pillar of Defense was about 85%. The system was employed during operation "Protective Edge", intercepting rockets launched from Gaza towards southern, central and northern parts of Israel. As of August 2014, ten Iron Dome batteries had been deployed throughout Israel. During the 50 days of the conflict 4,594 rockets and mortars were fired at Israeli targets; Iron Dome systems intercepted 735 projectiles that it determined were threatening, achieving an intercept success rate of 90 percent. Only 70 rockets fired at Israel from Gaza failed to be intercepted. One civilian was killed and three others and nine servicemen were wounded by mortar bombs, but they were not in areas protected by Iron Dome. Only 25 percent of rockets fired were determined to be threatening due to the low accuracy and unstable trajectory of the poor-quality rockets fired. Six systems had been deployed prior to hostilities, and three more were rushed into service for a total of nine batteries used during the conflict; a tenth system was delivered, but not deployed due to a shortage of staff. On 10 May 2018, the Islamic Revolutionary Guard Corps of Iran allegedly launched 20 rockets from Syria toward Israel in retaliation for recent Israeli airstrikes against IRGC facilities. According to an IDF spokesperson, 16 of the rockets fell short of the Israeli border, and Iron Dome intercepted the other four. Israel reported no casualties or damage. The Iron Dome system intercepted 100 rockets that were launched from the Gaza Strip in mid-November 2018. On 21 January 2019, the IDF released footage online of a Syrian Arab Army rocket attack on the Golan Heights being intercepted by Iron Dome. The video was shot by skiers at Mount Hermon ski resort; Israeli authorities announced that the resort was closed until further notice. The attack was in response to Israel's launching of nine rockets at SAA targets in western Damascus. Israel is planning to deploy Iron Dome batteries at sea, where they will protect off-shore gas platforms, working in conjunction with Israel's Barak 8 missile system. The Israel Navy's future Sa’ar 6 missile ships will deploy two Iron Dome batteries on each ship. On 17 December 2016, Azerbaijan Defense Industry Minister Yavar Jamalov told reporters that Azerbaijan had reached an agreement with Israel to purchase Iron Dome batteries in the first confirmed foreign sale of the system. The country's acquisition of the system is believed to be related to neighboring Armenia's purchase of Russian Iskander short-range ballistic missiles. On 23 November 2012, The Economic Times reported that Indian Defense planners were considering the possibility of India acquiring an indigenous version of Iron Dome, keeping a close watch on the performance of Iron Dome during the 2012 Operation Pillar of Defense. Several months earlier, the military scientists in the Defense Research and Development Organisation (DRDO) had suggested that India look at a joint development program with Israeli firms to develop an Indian version of Iron Dome. They believed Israel's short range missile defense requirements have several parallels to the Indian threat from Pakistan, which includes a "battlefield range" quasi tactical ballistic nuclear weapon delivery system, called Nasr, which some Indian defense sources say the Iron Dome might be an effective deterrent against, as well as the vulnerability of its cities to attacks from militants. However they have not used any missiles against India. "The Israeli team comes and works in our laboratories. Our team goes and works in their laboratories and industries. There is a learning that is taking place which was not there when we buy things and integrate with existing products... we have started discussions about Iron Dome for co-development (in India)," Dr W. Selvamurthy, Chief Controller looking after international cooperation said. On 8 February 2013, Marshal Norman Anil Kumar Browne, commander of the Indian Air Force, told reporters that Iron Dome is not suitable for the service. The announcement came after two years of discussions. In August 2013, India resumed attempting to acquire the Iron Dome system after Israel agreed to transfer system technology. Iron Dome could complement the domestic long-range Indian Ballistic Missile Defence Programme air defense system. In 2017, Israeli Prime Minister Benjamin Netanyahu and his Indian counterpart Narendra Modi have signed a deal to buy the Iron Dome system, which is worth around $2 billion. In May 2018, Romania's Romaero signed a deal to purchase the Iron Dome system. On 10 March 2010, The Jerusalem Post reported that the Israeli Ministry of Defense was in talks with a number of European countries about the possible sale of the system in order to protect NATO forces deployed in Afghanistan and Iraq. During a visit to Israel in the summer of 2011, Kwon Oh-bong, vice commissioner of the Defense Acquisition Program Administration in Seoul, expressed interest in purchasing the system in order to counter the threat posed by North Korean artillery, rockets, and missiles. South Korea was considered unlikely to buy the Iron Dome system due to the number of artillery pieces it would face, the coverage it would need to provide (around Seoul), and the high cost of interceptors; effort is being focused on disrupting the "Kill Chain" to immediately detect and destroy artillery and missile units. In August 2014, South Korea once again emerged as interested in buying the Iron Dome system for protection against rocket attacks. In October 2017, South Korea announced it would develop its own Iron Dome-type C-RAM system using hit-to-kill interceptors. On 16 August 2011, Raytheon Company announced that it had teamed with Rafael in order to lead marketing in the United States for the Iron Dome system. "Iron Dome complements other Raytheon weapons that provide intercept capabilities to the US Army's Counter Rocket, Artillery, and Mortar initiative at forward operating bases," said Mike Booen, vice president of Raytheon Missile Systems' Advanced Security and Directed Energy Systems product line. "Iron Dome can be seamlessly integrated with Raytheon's C-RAM systems to complete the layered defense." On 10 November 2011, The Jerusalem Post reported that the US Army had expressed interest in acquiring the system, to be deployed outside forward bases in Iraq and Afghanistan that could potentially be targeted by artillery rockets. The US military had discovered 107 mm rockets in Iraq in the past. On 1 December 2011, The Jerusalem Post reported that the US Army would decide in January 2012[needs update] whether it would purchase the system. Yossi Druker, head of Rafael's Air-to-Air Directorate, said that the initial deal is valued at $100 million, but could reach several hundred million dollars over a number of years. In April 2016, Iron Dome's Tamir interceptor successfully shot down a UAV during a test firing in the United States, the system's first trial on foreign soil. In January 2019 it was reported that the United States will purchase two Iron Dome batteries for 373 million dollars. The batteries will be deployed to protect US armed forces in hostile areas of operation. The order is for two command posts and radars, 12 launchers, and 480 missiles. Following the system's deployment in April 2011, Iron Dome was used to successfully intercept Katyusha rockets fired by Palestinian militants. In August that year, Iron Dome intercepted 20 missiles and rockets fired into Israel. However, in one instance the system destroyed four out of five rockets fired at the city of Beersheba but failed to stop the fifth which killed one man and injured several others. In November 2012, during Operation Pillar of Defense, the Iron Dome's effectiveness was estimated by Israeli officials at between 75 and 95 percent. According to Israeli officials, of the approximately 1,000 missiles and rockets fired into Israel by Hamas from the beginning of Operation Pillar of Defense up to 17 November 2012, Iron Dome identified two thirds as not posing a threat and intercepted 90 percent of the remaining 300. During this period the only Israeli casualties were three individuals killed in missile attacks after a malfunction of the Iron Dome system. In comparison with other air defense systems, the effectiveness rate of Iron Dome is very high. Defense consultant Steven Zaloga stated that Iron Dome's destruction of 90 percent of missiles it targeted is "an extremely high level", above that usually expected for air defense systems. Slate reported that the effectiveness rate is "unprecedented" in comparison with earlier systems such as the Patriot missile defence system. Defense reporter Mark Thompson wrote that, the "lack of Israeli casualties suggests Iron Dome is the most-effective, most-tested missile shield the world has ever seen." During Operation Protective Edge Iron Dome's interceptors were claimed to have struck down 87–90% of their targets, totaling 735 successful interceptions. In the 2006 war with Hezbollah, prior to Iron Dome's development, during 34 days of fighting, 4,000 rockets landed and 53 Israelis were killed. However, in the 2014 war with Gaza, the 50-day conflict and 3,360 rockets resulted in just two rocket-related deaths. In 2006, about 30,000 insurance claims for rocket-related damage were filed while in 2014, there were just 2,400. Prior to its deployment, the Iron Dome was criticized as ineffective in countering the Qassam threat for the southern city of Sderot, given the short distance and flight time between the much-attacked city and the rocket launching pads in the Gaza Strip. Israeli defense officials insisted that with recent improvements to Iron Dome, the system was fully able to intercept Qassams. An unpublished 2013 report by Theodore Postol, Mordechai Shefer and Richard Lloyd, argued that the official effectiveness figures for Iron Dome during Operation Pillar of Defense were incorrect. Although Postol had earlier lauded Iron Dome's effectiveness, after studying YouTube videos of the warhead interceptions as well as police reports and other data, he argued that "Iron Dome’s intercept rate, defined as destruction of the rocket's warhead was relatively low, perhaps as low as 5%, but could well be lower." Postol reached this conclusion mainly from an analysis of non-official footage of interceptions taken by civilians and published on YouTube. The report's claims appear puzzling, to say the least, particularly the contention that Iron Dome did not succeed in causing the rocket’s warhead to explode... These clips were not filmed during sophisticated trials; they were taken by civilians who photographed them using their smartphones and uploaded them to YouTube. In general, it is not possible to know where they were filmed or the direction in which the person filming was looking. It is very difficult to conduct precise analyses, and it is generally difficult to learn from the film about the geometry of the missile’s flight. The researchers also looked for double explosions and failed to find them. This is not surprising, since such explosions are very close to each other both in distance and in time – less than a thousandth of a second. There is no way that a smartphone camera could distinguish between a double and a single explosion. Uzi Rubin writes: "So how did Postol reach such a radical conclusion? He made a series of assumptions on Iron Dome performance, most of them very wrong, and examined public domain video clips shot from smartphones and media cameras that showed the wind-sheared smoke trails of Iron Dome interceptors, but in which the engaged rockets remained invisible. 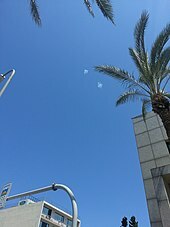 From this half-blind sky picture, he guessed interception geometries that, when matched with his own gross underestimation of Iron Dome performance, yielded an intuitive estimate of a 5 percent to 10 percent success rate... Postol’s estimates are simply wrong." Postol additionally used the amount of claims filed by the Property Tax Authority and the number of Israeli Police Reports (taken from the Israeli Police website) relating to rockets to support his argument. In relation to Postol's argument based on the number of reports the Israeli Police received, Israeli Institute of National Security Studies wrote: "However, Israel Police reports on calls from citizens, and these include reports on falling fragments, rocket parts, and duds." Research published in 2018 analyzed the numbers of deaths, injuries, and property damage claims per rocket fired for four conflicts. These were the Second Lebanon War of 2006, Operation Cast Lead in 2008–2009, Operation Pillar of Defense in 2012, and Operation Protective Edge in 2014. By comparing the loss rates per rocket of the latter two operations (which had Iron Dome batteries) to the first two (which did not), it estimated the interceptor batteries’ overall effectiveness at reducing Israeli losses from rockets. Those estimates suggest Iron Dome intercepted 59 to 75 percent of all threatening rockets during Protective Edge. "Threatening" means the rockets struck populated areas or were intercepted beforehand. The interceptions likely prevented $42 to $86 million in property damage, three to six deaths, and 120 to 250 injuries. Since those percentages include rockets anywhere in Israel, the high interception rates claimed for only the areas that batteries were defending seem plausible. By contrast, Iron Dome apparently intercepted less than 32 percent of threatening rockets during Pillar of Defense, perhaps much less. The prevented at most two deaths, 110 injuries and US$7 million in damage. The research also implies the number of rocket hits on populated areas was understated. Conversely, the number of threatening rockets seems overstated. The effective interception rate for Pillar of Defense therefore may have been markedly less than reported. The study further estimated that improvements in Israeli civil defenses, such as warning sirens and hardened shelters, were at least as good as Iron Dome at reducing civilian deaths and injuries from rockets. These results partly support critics (like Theodore Postol) of Iron Dome's effectiveness during Pillar of Defense. However, they also partly support proponents (like Uzi Rubin) of the system's effectiveness during Protective Edge. According to Ronen Bergman, in 2012, during Operation Pillar of Defense, Israel agreed to an early cease-fire, "for a reason that has remained a closely guarded secret: The Iron Dome anti-missile defense system... had run out of ammunition." Bergman says that as a result of the experience, Israel had tried to prepare larger stocks of interceptors for future rounds of fighting. 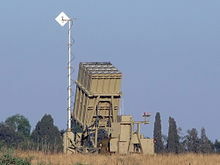 In 2010, before the system was declared operational, Iron Dome was criticized by Reuven Pedatzur, a military analyst, former fighter pilot and professor of political science at Tel Aviv University for costing too much compared to the cost of a Qassam rocket (fired by Palestinian forces), so that launching very large numbers of Qassams could essentially attack Israel's financial means. The estimated cost of each Tamir interceptor missile has been cited from US$20,000–50,000 whereas a crudely manufactured Qassam rocket costs around $800 and the cost of each Hamas Grad rocket is only several thousand dollars each. Rafael responded that the cost issue was exaggerated since Iron Dome intercepts only rockets determined to constitute a threat, and that the lives saved and the strategic impact are worth the cost. Other anti-rocket systems, such as the Nautilus laser defense system, were argued to be more effective. From 1995 to 2005, the United States and Israel jointly developed Nautilus but scrapped the system after concluding it was not feasible, having spent $600 million. The US Navy continued R&D on the system. American defense company Northrop Grumman proposed developing a more advanced prototype of Nautilus, Skyguard. Skyguard would use laser beams to intercept rockets, with each beam discharge costing an estimated $1,000–$2,000. With an investment of $180 million, Northrop Grumman claimed it could possibly deploy the system within 18 months. Israeli defense officials rejected the proposal, citing the extended timeline and additional costs. In an op-ed in Haaretz, Jamie Levin suggests that the success of the Iron Dome system will likely increase demands to field additional systems across Israel. Budget shortfalls mean that Israel will be forced to weigh spending on missile defenses against other expenditures. Such funds, he argues, will likely come from programs intended to help the most vulnerable sectors of society, such as social welfare. Yoav Fromer, writing in The Washington Post, thanked Iron Dome for the lack of fatalities and the relatively low casualty rate among Israeli civilians, and said that the technology appears to provide "both a physical and a psychological solace that enables Israelis to go about their business." However, in his view, over time, Iron Dome may do the Israeli public more harm than good because despite the fact it is a "tactical miracle" it may help create a serious strategic problem to Israelis' long-term security because, by temporarily minimizing the dangers posed by rocket attacks, it distracts Israelis from seeking a broader regional political solution that could finally make systems such as Iron Dome unnecessary. In Fromer's view, the Israeli government is "not exactly brimming with creative ideas to reignite the peace process with the Palestinians. And with Iron Dome, why would it? As long as the Israeli public believes it is safe, for now, under the soothing embrace of technology, it will not demand that its political leaders wage diplomacy to end violence that mandated Iron Dome in the first place. Since Iron Dome has transformed a grim reality into a rather bearable ordeal, Israelis have lost the sense of urgency and outrage that might have pushed their government" to make necessary concessions in exchange for peace. In Fromer's view, Israelis risk confusing the short-term military advantage provided by Iron Dome with the long term need for an original and comprehensive diplomatic solution. Amir Peretz, an Israeli cabinet minister, told The Washington Post that Iron Dome is no more than a stopgap measure, and that "In the end, the only thing that will bring true quiet is a diplomatic solution." ^ a b c "Iron Dome: Defense System Against Short Range Artillery Rockets" (PDF). Rafael Advanced Defense Systems. Retrieved 6 August 2009. ^ "The secret of the wonder weapon that Israel will show off to Obama", Time, 19 March 2013 . ^ Israel's Missile Defense System, June 2016 . ^ Lappin, Yaakov. "Tenth Iron Dome battery deployed to protect Israel from rockets". The Jerusalem Post. Retrieved 11 August 2014. ^ "Air Defense: U.S. Pays For More Iron Dome", Strategy page, retrieved 11 July 2014 . ^ Lazareva, Inna (10 July 2014). "The Iron Dome: what is it and how does it work?". The Telegraph. Retrieved 10 July 2014. ^ a b c d Ben-David, Alon (18 March 2008). "Iron Dome advances to meet Qassam threat". Jane's. Retrieved 18 August 2011. ^ a b "Iron Dome Air Defense Missile System, Israel". Army technology. Retrieved 18 August 2011. ^ Sharp, Jeremy M. (16 September 2010). "U.S. Foreign Aid to Israel" (PDF). Congressional Research Service. Archived from the original (PDF) on 31 July 2015. Retrieved 18 August 2011. ^ a b Katz, Yaakov (10 March 2012). "Iron Dome ups its interception rate to over 90%". The Jerusalem Post. Retrieved 10 March 2012. ^ Williams, Dan (16 November 2012). "Israel's Barak seeks three more Iron Dome rocket interceptors". Reuters. Retrieved 9 April 2013. ^ a b "Israel deploys 'Iron Dome' rocket shield". Al Jazeera English. 27 March 2011. Retrieved 18 August 2011. ^ a b Pfeffer, Anshel; Yanir Yagna (7 April 2011). "Iron Dome successfully intercepts Gaza rocket for first time". Haaretz. Retrieved 7 April 2011. ^ a b c Livnat, Yael (18 November 2012). "Tweet" (Twitter). IDF Spokesperson's Unit. Retrieved 19 April 2012. ^ a b c Livnat, Yeal (5 April 2012). שנה ליירוט הראשון של כיפת ברזל: "ההצלחה – בזכות הלוחמים" [One year to first interception of Iron Dome: "The success – because of the fighters"] (in Hebrew). IDF Spokesperson's Unit. Archived from the original on 27 September 2013. Retrieved 19 April 2012. ^ a b c Levinson, Charles; Adam Entous (26 November 2012). "Israel's Iron Dome Defense Battled to Get Off the Ground". The Wall Street Journal. Retrieved 17 December 2012. ^ "Israel-Hizbullah conflict: Victims of rocket attacks and IDF casualties". Israeli Ministry of Foreign Affairs. Retrieved 21 August 2009. ^ Rubin, Uzi (June 2007). "The Rocket Campaign against Israel during the 2006 Lebanon War" (PDF). The Begin-Sadat Center for Strategic Studies. Archived from the original (PDF) on 2 February 2012. Retrieved 15 August 2009. ^ "Summary of rocket fire and mortar shelling in 2008" (PDF). Intelligence and Terrorism Information Center. 1 January 2009. Retrieved 31 July 2014. ^ "Defense Minister selects Rafael anti-missile defense system". Haaretz. 4 February 2007. Retrieved 4 August 2009. ^ a b c d "Israel successfully tests "Iron Dome" rocket & artillery shell defence system". defpro.com. 27 March 2009. Archived from the original on 11 March 2012. Retrieved 4 August 2009. ^ "Ballistic Missile Defense: Effectiveness of Israel's Iron Dome System". Mostlymissiledefense.com. 19 July 2012. Retrieved 18 November 2012. ^ a b Yaakov, Katz (31 August 2011). "IAF deploys third Iron Dome battery outside Ashdod". The Jerusalem Post. Retrieved 19 April 2012. ^ a b Entous, Adam; Caren Bohan (13 May 2010). "Obama seeks $205 million for Israel rocket shield". Reuters. ^ Amos Harel (13 May 2010). "Iron Dome defense system gets new backer: Barack Obama". Haaretz. Archived from the original on 16 May 2010. ^ Hilary Leila Krieger (21 May 2010). "US approves $205m. for Iron Dome". The Jerusalem Post. ^ "United States–Israel Missile Defense Cooperation and Support Act". Library of Congress. Retrieved 21 May 2010. ^ Katz, Yaakov (10 April 2011). "IDF conditionally ceases air strikes on Hamas targets". The Jerusalem Post. ^ Harel, Amos (9 May 2011). "Israel to invest $1 billion in Iron Dome missile defense system". Haaretz. Retrieved 9 May 2011. ^ Williams, Dan (4 April 2012). "Israel To Make Do With Fewer Iron Dome Units". Reuters. Retrieved 19 April 2012. ^ "Statement by Secretary of Defense Leon E. Panetta on Meeting with Minister Ehud Barak" (Press release). Department of Defense. Retrieved 22 June 2012. ^ "House Report 112-479–NATIONAL DEFENSE AUTHORIZATION ACT FOR FISCAL YEAR 2013". Retrieved 22 June 2012. ^ "S.3254—NATIONAL DEFENSE AUTHORIZATION ACT FOR FISCAL YEAR 2013". Retrieved 22 June 2012. ^ "Congress Appropriates $235 Million For Israeli Iron Dome Procurement". Defense Daily. 24 January 2014. Retrieved 13 July 2014. ^ Capaccio, Tony (27 May 2014). "Israel Agrees to Spend Half of Iron Dome Funds in U.S." Bloomberg. Retrieved 13 July 2014. ^ Everett, Burgess. "Congress backs aid to Israel". www.politico.com. Politico. Retrieved 2 August 2014. ^ Obama signs Iron Dome extra funds bill, Jewish Telegraphic Agency (JTA), 5 August 2014. ^ Frelinghuysen, Rodney (17 July 2014). "Text - H.R.4870 - 113th Congress (2013-2014): Department of Defense Appropriations Act, 2015". www.congress.gov. ^ "Senate Report 113-211 - DEPARTMENT OF DEFENSE APPROPRIATIONS BILL, 2015". www.govinfo.gov. ^ "Arrow Weapon System" (PDF). Archived from the original (PDF) on 22 December 2014. Retrieved 31 July 2014. ^ "House lawmakers want rights to Iron Dome weapon tech". Retrieved 25 June 2012. ^ "U.S. Attaches Strings to Israeli Iron Dome Funds". Retrieved 25 June 2012. ^ "buy-america-make-iron-dome-joint-us-israel-system". Retrieved 25 June 2012. ^ "Israel Readies First US Co-Production Order for Iron Dome". Defense News. 12 July 2014. Retrieved 13 July 2014. ^ a b c "New Israeli anti-missile system sees success in Gaza, altering war against rockets". The Washington Post. Associated Press. 10 April 2011. Retrieved 13 April 2011. ^ מסירות, ציונות וכמה חלקים מ-טויז אר אס, Hayadan (in Hebrew), IL: Technion – Israel Institute of Technology, 9 July 2014, retrieved 9 July 2014, As scientists we dream to sit in our offices without limitations of time and budget and to develop perfect products. But the reality is different, and these constraints forced us to think hard. There are parts in the system forty times cheaper than the parts we buy normally. I can give you even a scoop – it contains the world's only missile components from Toys R Us... One day I brought to work my sons toy car. We Passed it among us, and we saw that there were actually components suitable for us. More than that I can not tell. .
^ "Israeli arms company successfully tests Iron Dome anti-Qassam missile". Haaretz. 7 July 2008. Retrieved 27 July 2009. ^ "Israel successfully tests anti-rocket system". The Guardian. 27 March 2009. Retrieved 24 August 2009. ^ "Iron Dome system successful in tests". The Jerusalem Post. 16 July 2009. Archived from the original on 29 May 2012. Retrieved 27 July 2009. ^ "IDF moves one step closer to getting Iron Dome". The Jerusalem Post. 23 August 2009. Archived from the original on 29 May 2012. Retrieved 24 August 2009. ^ Katz, Yaakov, "Iron Dome Successfully Intercepts Kassam, Katyusha Barrages", The Jerusalem Post, 15 July 2010, p. 2. ^ "Vilnai: Israel has strategic reason not to use Iron Dome". The Jerusalem Post. 24 March 2011. Retrieved 25 March 2011. ^ a b "Barak confirms: 'Iron Dome' to be deployed within days". The Jerusalem Post. 25 March 2011. Retrieved 25 March 2011. ^ Sarusi, Neta (21 August 2009). "Boulevards (Sderot) of Defense". Bamahane (in Hebrew). No. 3001. p. 12. ^ Sarusi, Neta (16 October 2009). ""The Marksmen" Don an Iron Dome". Bamahane (in Hebrew). No. 3008. p. 18. ^ Harel, Amos (3 February 2010). "IDF: No plans to deploy anti-missile system in Sderot". Haaretz. Archived from the original on 4 February 2010. Retrieved 3 February 2010. ^ ""Iron Dome" Intercepts Rocket From Gaza". IDF Blog. Israel Defense Forces. 7 April 2011. Retrieved 7 April 2011. ^ Issacharoff, Avi (8 April 2010). "IDF strikes kill nine in Gaza as barrage of mortars hits Israel". Haaretz. Retrieved 8 April 2010. ^ a b Yagna, Yanir; Anshel Pfeffer (12 April 2011). "Israel speeds up third Iron Dome battery in wake of Gaza attacks". Haaretz. Retrieved 12 April 2011. ^ Harel, Amos; Avi Issacharoff (5 August 2011). "IDF redeploys Iron Dome as rocket fire from Gaza increases". Haaretz. Retrieved 5 August 2011. ^ Curiel, Ilana; Shmulik Hadad; Abigail Looshi (18 August 2011). "Iron Dome intercepts 2 rockets fired at Israel". Ynetnews. Retrieved 18 August 2011. ^ a b Pfeffer, Anshel (22 August 2011). "Israeli defense sources: Gaza terror groups change tactics to avoid Iron Dome system". Haaretz. Retrieved 22 August 2011. ^ Yehoshua, Yossi (21 August 2011). "Municipalities 'battle' over Iron Dome". Ynetnews. Retrieved 21 August 2011. ^ "Barak: IDF won't tolerate rocket attacks from Gaza". The Jerusalem Post. 21 August 2011. Retrieved 21 August 2011. ^ Lake, Eli, "Missile Defense Scores Political Hits", The Washington Times, 30 August 2011, p. 9. ^ Azoulai, Yuval (23 August 2011). "Rafael to double Iron Dome production". Globes. Retrieved 25 August 2011. ^ Katz, Yaakov (1 December 2011). "IAF chief: 4th Iron Dome battery to be deployed soon". The Jerusalem Post. Retrieved 4 December 2011. ^ Buhbut, Amir (8 December 2011). שילוב נשים בצה"ל: קצינה תפקד על סוללת כיפת ברזל [Integration of women in the IDF: female officer to command on an Iron Dome battery] (in Hebrew). Walla!. Retrieved 8 December 2011. ^ Katz, Yaakov (6 December 2011). "Defense Ministry mulls permanent Haifa Iron Dome". The Jerusalem Post. Retrieved 6 December 2011. ^ Zitun, Yoav (6 December 2011). "Gov't mulling Iron Dome system in Haifa". Ynetnews. Retrieved 6 December 2011. [[#cite_ref-jpost75%Dec11_88-0|^]] Katz, Yaakov (30 December 2011). "Iron Dome successful in downing 75% of rockets". The Jerusalem Post. Retrieved 1 January 2012. ^ a b c Paraszczuk, Joanna (9 August 2011). "Petition rejected to deploy Iron Dome near border towns". The Jerusalem Post. Retrieved 10 August 2011. ^ a b c Amir Buhbut (29 December 2011). בשל רשלנות: נזק של מיליון דולר למערכת כיפת ברזל [Due to negligence: million dollar damage to Iron Dome system]. Walla! (in Hebrew). Retrieved 29 December 2011. ^ a b c Menashe, Carmela (29 December 2011). 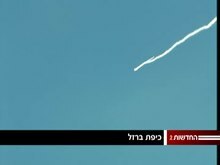 תקלה חמורה ב"כיפת ברזל" [Serious malfunction at "Iron Dome"] (in Hebrew). Kol Yisrael Radio website. Archived from the original on 29 July 2014. Retrieved 29 December 2011. ^ a b Ben-Yishai, Ron (29 December 2011). "Iron Dome missiles damaged". Ynetnews (in Hebrew). Retrieved 29 December 2011. ^ Ziton, Yoav (2 January 2012). נפילת טילי כיפת ברזל: עונשי מחבוש לקצין ולנגדת [Fall of Iron Dome missiles: Mahbosh sentence for officer and NCO]. Ynetnews (in Hebrew). Retrieved 2 January 2012. ^ a b Zitun, Yoav (11 July 2012). "Iron Dome deployed in Eilat region". Ynetnews.com. Retrieved 11 July 2012. ^ "For the first time ever, an Iron Dome battery is tested in Eilat". 12 July 2012. Retrieved 2 August 2012. ^ "Israel to deploy Iron Dome system on Egyptian border". Ha'aretz. 12 July 2012. Retrieved 12 July 2012. ^ "IDF deploys Iron Dome battery near Eilat". The Jerusalem Post. 11 July 2012. Retrieved 11 July 2012. ^ "Pillar of Defense Ends in Ceasefire". Israeli Air Force website. 21 November 2012. Retrieved 9 April 2013. ^ Williams, Dan (17 November 2012). "Tel Aviv saved by Iron Dome intercept". Reuters UK. Retrieved 9 April 2013. ^ "Watching Israel's Missile Defense". CNN. 20 November 2012. Retrieved 21 November 2012. ^ "A Growing Arsenal of Homegrown Rockets Encounters Israel's Iron Dome". The New York Times. 9 July 2014. Retrieved 10 July 2014. ^ Lappin, Yaakov. "Tenth Iron Dome battery deployed to protect Israel from rockets". Jerusalem Post. Retrieved 11 August 2014. ^ "Israel strikes Iranian targets in Syria in response to rocket fire". BBC News. 10 May 2018. ^ "IDF attacks at least 160 targets in Gaza". ynetnews. 13 November 2018. Retrieved 15 November 2018. ^ Desk, News (22 January 2019). "IDF releases footage of skiers watching Iron Dome intercepting Syrian missile". ^ Baker, SinÃ©ad. "Video shows Israel's Iron Dome intercept a rocket over a ski resort in the Golan Heights". Business Insider. ^ "12 Iranian Soldiers Killed in Israeli Strike on Syria, Watchdog Says". 22 January 2019 – via Haaretz. ^ a b Indrani Bagchi; Josy Joseph (23 November 2012). "India eyes Israel's Iron Dome to counter Pak, puppets". The Economic Times. Retrieved 10 April 2013. ^ "Iron-Dome offer rejected". Dmilt.com. 8 February 2013. Archived from the original on 5 April 2015. Retrieved 10 April 2013. ^ Al-awsat, Asharq. "Middle-east Arab News Opinion". eng-archive.aawsat.com. ^ Luca, Ana Maria (18 May 2018). "Romania Buys Israel's Iron Dome Air Defence System". Balkan Insight. Retrieved 26 May 2018. ^ Katz, Yaakov (10 March 2010). "NATO forces interested in Iron Dome". The Jerusalem Post. Retrieved 18 August 2011. ^ Etsion, Udi (19 June 2011). "S. Korea eyes Iron Dome system". Ynetnews. Retrieved 19 August 2011. ^ "Raytheon Teams with Rafael to Market Iron Dome Weapon System" (Press release). Raytheon Company. 16 August 2011. Retrieved 19 August 2011. ^ Katz, Yaakov (10 November 2011). "US may purchase Iron Dome batteries". The Jerusalem Post. Retrieved 16 November 2011. ^ Katz, Yaakov (1 December 2011). "US may buy Iron Dome to defend ME bases". The Jerusalem Post. Retrieved 4 December 2011. ^ Army Reboots Cruise Missile Defense: IFPC & Iron Dome. Breaking Defense. 11 March 2019. ^ Dan Williams (15 April 2011). "Rocket shield reprieves Israeli frontiers, for now". Reuters. Retrieved 21 November 2012. ^ Ori Lewis (22 August 2011). "Israel lauds success of Iron Dome missile interceptor". Reuters. Retrieved 21 November 2012. ^ a b Clay Dillow (19 November 2012). "How Israel's 'Iron Dome' Knocks Almost Every Incoming Missile Out Of The Sky". Popular Science. Retrieved 20 November 2012. ^ Mark Thompson (19 November 2012). "Iron Dome: A Missile Shield That Works". Time. Retrieved 20 November 2012. ^ Harriet Sherwood (19 November 2012). "Israelis put faith in Iron Dome missile defence system". Guardian.co.uk. Retrieved 21 November 2012. ^ Thompson, Mark (19 November 2012). "Iron Dome: A Missile Shield that Works". Time Magazine website. Retrieved 9 April 2013. ^ "How Israel's "Iron Dome" works". ^ "50 days of Israel's Gaza operation, Protective Edge â€" by the numbers - Operation Protective Edge - Jerusalem Post". www.jpost.com. ^ "Why did the Iron Dome not intercept the rocket from Gaza Monday morning? - Arab-Israeli Conflict - Jerusalem Post". www.jpost.com. Retrieved 25 March 2019. ^ a b "Iron Dome does not answer threats". The Jerusalem Post. 9 May 2010. Retrieved 26 May 2010. ^ "Iron Dome system found to be helpless against Qassams". Haaretz. 22 February 2008. Retrieved 9 August 2009. ^ Postol, Theodore A (15 July 2014). "An Explanation of the Evidence of Weaknesses in the Iron Dome Defense System". MIT Technology Review. ^ "Israeli Rocket Defense System Is Failing at Crucial Task, Expert Analysts Say", MIT Technology Review, 10 July 2014 . ^ a b Pedatzur, Reuven (9 March 2013). "How many rockets has Iron Dome really intercepted?". Haaretz. ^ Talbot, David (26 November 2012). "Why Israel's "Iron Dome" Missile-Defense System Actually Works". MIT Technology Review. ^ Postol, Theodore, Part 1: Iron Dome or Iron Sieve? Evidence Questions Effectiveness of U.S.-Funded Israeli Missile Shield and Postol, Theodore (31 July 2014), "Part 2: Weapons Expert Theodore Postol Asks, Is Israel's Iron Dome Really an Iron Sieve? ", Democracy Now! . ^ "How Many Rockets Did Iron Dome Shoot Down? ", Defense Update, 23 March 2013 . ^ Rubin, Uzi (31 March 2013), "Cold War Mentality", Defense News . ^ Bergmanaug, Ronen (11 August 2014), "How Hamas Beat Israel in Gaza", The New York Times, p. 10 . ^ Fox, Stuart (30 March 2011). "Iron Dome: Israel Deploys Unique, Controversial Missile System". msnbc.com. Retrieved 18 August 2011. ^ "Israel's Iron Dome changes the face of battle", Ynet news, Associated Press, 12 July 2014 . ^ Motti Bassok; Zvi Zerahia (17 November 2012). חשבונית ראשונה על עמוד ענן – 750 מיליון שקל לכיפת ברזל [First Receipt for Pillar of Cloud – 750 mil. NIS for Iron Dome] (in Hebrew). Retrieved 9 April 2013. ^ "What are Qassam Rockets?". Jewish Policy Center. Archived from the original on 14 April 2009. Retrieved 9 August 2009. "The raw materials for one rocket can cost up to $800." ^ "Iron Dome rocket defense system will be operational by 2010". Haaretz. 10 April 2009. Retrieved 9 August 2009. ^ Levin, Jamie (23 March 2012). "Israel's economy will pay heavy price for Iron Dome". Haaretz. Retrieved 19 April 2012. ^ Fromer, Prof. Yoav (14 July 2014), "The missiles keeping Israel safe may do more long-term harm than good", The Washington Post . 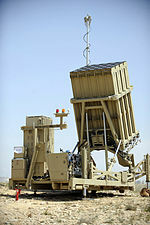 Wikimedia Commons has media related to Iron Dome.